A 2018 Series Ford Fusion NASCAR Cup Series car has raised $300,000 for a children’s charity after being sold off at Barrett-Jackson Scottsdale in Arizona. This car was built-up and fielded by Front Row Motorsports and driven by David Ragan in select races in 2018. It was sold with a fully functioning Ford Performance Roush Yates Racing engine built in the company’s Mooresville, NC, facility,” which produces over 750 hp. It also has the original 4-speed G-Force transmission, 4.63 rear gear, Goodyear racing slicks and even one of Ragan’s carbon fiber seat shells with the SFI-certified insert and 7-point racing harness. 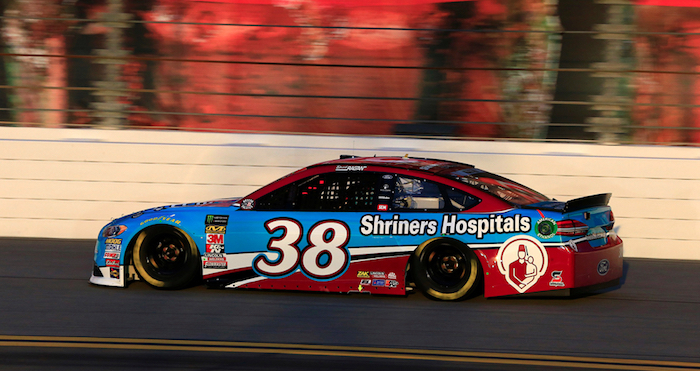 All proceeds from the sale of the NASCAR Ford Fusion benefitted the Shriners Hospital for Children – a network of 22 non-profit medical facilities situated across North America. The hospital chain, which is headquartered in Tampa, Florida, specializes in treating birth-related defects, spinal cord injuries, burns and more. Ragan would often visit the hospital locations as part of his partnership with the company. “It’s incredible to have [Ragan] who’s such a supporter, and who has such a platform to be able to reach so many people and let everybody know about the mission of the Shriners and the lives that can be changed by the care that we offered,” said Shriners spokeswoman Trana Pittam following ong of Ragan’s visits last year. The Ford Fusion NASCAR stock car body has now been retired, with Ford introducing a new Mustang body for 2019. The automaker could face an uphill battle in NASCAR in 2019, with Chevrolet entering the second season with its Camaro ZL1 body and Toyota entering the third with its Camry body. Ford and Chevy now both run the Camaro in the NASCAR Xfinity and NASCAR Cup series, whereas Toyota runs the Supra in Xfinity and the Camry in Monster Energy. You can check out the original auction listing for the David Ragan NASCAR Ford Fusion at this link for additional information and photos.